Open dirt course with elevation, cliffs, and thick brush surrounding creek. Difficult to play when muddy. I-70; Horizon Dr. exit, south to a left on 27 1/2 Rd., then left on Patterson (aka F) at T intersection. At Legends Dr., turn left into vacant area (dirt between houses - goes to a desert). Very fun, challenging course. I didn't see anybody else out here playing on a cool saturday afternoon, very quiet course! Remember to download the map for this course off of the site here for reference! It is accurate except for one caveat: hole #1 actually plays as hole #2 on the map, starting right past (north of) the #18 basket. Continue like this thru hole #6, where you will find a tee pad ontop of a small hill that plays northeast up the slope into the open terrain to hole #7 (not listed on the map). From here, you are caught up and the map is accurate for the rest of the course. Beware that there is a bridge that is downed crossing the ditch on #13, and it is quite dangerous. Do not attempt to cross, just find a good place to jump the water... Also, if it's sunny and hot out, there is very little shade, so would be very exposed, but as had been said, it would be a nightmare if it rained and was muddy. This course is rugged and in an area that is far from park like. This course could use some more risk vs. reward along with some more left and right variety. This course is just about always straight away off the tee. There is little in the way of trees or brush except where a deep creek runs through the course. It follows the creek on its way out and back again. This provides some risk in that discs in the creek can easily be unplayable or lost. Unfortunately it plays out with the creek on your left and back with the creek on your left. This gets repetitive and was not my favorite aspect of the course layout. It also lacks flow so it can be difficult to find your way from basket to tee. Without any vegetation it is not possible to follow paths to the next tee either. With the lack of signs you will really want a map for this course. Luckily there is a good one on the local club web site. The directions call for turning into the course at the end Legends Dr. this does not mean turn on this street but to turn into the vacant lot where Legends Dr. ends. Turn into the dirt lot, no road, and look for the concrete pad that is the first tee. Along with no signs there are no facilities so bring your own water and TP. With all of that said I really did enjoy this course. I liked the elevated tees and this is a course for bombing drives. I don’t have the big arm to really challenge this course but pars are generally within reach even for me. There are some really excellent basket placements. The area is not shared by any other user so it is only disc golfers. I would play this course again and recommend to other players if they were not beginners. It is worth the opportunity to play a unique course such as this one. 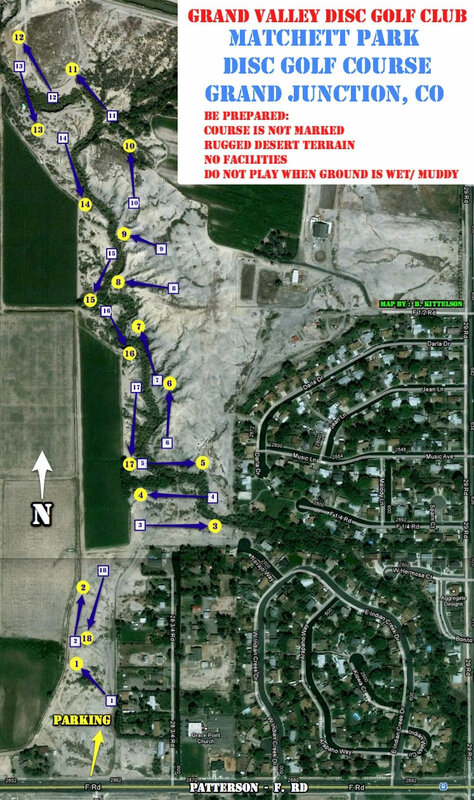 Very difficult course, that has many chances to lose your disc. However, it is designed for many diverse shots and has some nice views. Wear your boots as it goes up and down lots of hills.